Figure 2-7 Relationship between the carbonaceous, nitrogenous, and total BOD. Source: Principles of surface water quality modeling and control by R. V. Thomann and J. A. Mueller, © 1987, Reprinted by permission of Pearson Education, Inc., Upper Saddle River, NJ. BODu: Ultimate BOD of the carbonaceous and nitrogenous components of oxygen consumption at completion of both the carbonaceous decomposition and nitrification processes. 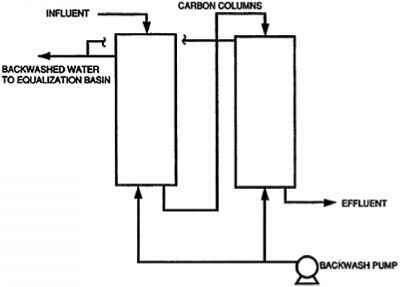 The length of time needed to reach the "ultimate" endpoints of the carbonaceous and nitrogenous components designated in Figure 2-7 (CBODu and NBODu) depends on several factors, including the composition of the wastewater and the corresponding rate of decomposition for its components. For predominately labile fractions of organic carbon that are easy for bacteria to decompose (e.g., mostly sugars, short chain molecules), decomposition can be completed within about 20 to 30 days. In contrast, for refractory organic matter that is strongly resistant to bacterial decomposition (e.g., mostly cellulose, long chain molecules such as pulp and paper waste), complete decomposition might require an incubation period of anywhere from 100 to 200 days. Decomposition rates for a sample of wastewater effluent from a POTW with secondary treatment, consequently, tend to be lower than rates for raw wastewater because the easily decomposed sugars have already been removed by the treatment process. Timing of the nitrification process is also dependent on several factors. These include the ratio of organic nitrogen compounds to ammonia and the lag time necessary to hydrolyze and convert the compounds to ammonia, the presence of adequate numbers of nitrifying bacteria in the water to begin the nitrification process, alkaline pH levels, and the presence of sufficient oxygen for bacterial respiration. The net effect of these factors is to inhibit nitrification immediately downstream from POTW outfalls (Chapra, 1997). Similarly, in a laboratory sample if a "seed" population is not available for nitrification during the 5-day incubation period, the measured BOD5 will reflect only the carbonaceous component (i.e., CBOD5). If, however, factors are suffi cient for nitrification to occur in the laboratory sample, the measured BOD5 will reflect both the carbonaceous and nitrogenous components (see Hall and Foxen, 1984). Is incorporating the nitrogenous component and using BODu important enough to eschew the more familiar carbonaceous CBOD5 when presenting BOD information? The answer is yes. Chapra (1997) calculates that the oxygen consumed in nitrification is about 30 percent of the oxygen consumed in carbonaceous oxidation of pure organic matter. If this finding was not persuasive enough for the inclusion of nitrification in an analysis of BOD, he also presents evidence that concentrations of NBOD and CBOD are actually nearly equivalent in untreated wastewater. Chapra theorizes that the discrepancy between calculated and the actual concentrations may be attributed to the fact that not all organic matter might be decomposable under the conditions of the BOD test and that nitrogen in wastewater might not all come from organic matter. Fertilizers and other sources likely add to the nitrogen pool, increasing the significance of NBOD in the environment. In sum, the true measure of the long-term oxygen demand of influent and effluent BOD loading and its effect on water quality in streams and rivers can be determined only if both the carbonaceous and nitrogenous components of BOD are combined and analyzed as BODu. Since it is impractical for most monitoring programs and laboratories to extend the incubation period beyond the traditional 5 days associated with the determination of BOD5, other surrogate methods must be used to determine CBODu, NBODu and BODu. Discussed below are the methods used in this study to determine these parameters. Leo et al. (1984) and Thomann and Mueller (1987) point out that conversion ratios for estimating CBODu concentrations based on either BOD5 or CBOD5 concentrations are dependent on the level of wastewater treatment. The proportion of easily degraded (labile) organic matter in the effluent declines as the efficiency of waste-water treatment is improved by upgrading a facility. In an analysis of effluent data from 114 primary to advanced municipal wastewater treatment plants, Leo et al. (1984) determined mean values of 2.47 and 2.84 for the CBODu: BOD5 and CBODu: CBOD5 ratios, respectively. The differences in the two ratios reflect the oxygen demand from nitrification associated with the BOD5 data (see Hall and Foxen, 1984).